Learn how to set stroke width and stroke properties, and apply effects like Shadow in Adobe Muse. Locate the Stroke section in the Control panel. If you click the Stroke text link, you can open the Stroke menu to precisely set the individual stroke weights and the alignment of each stroke. The color picker to the right of that link enables you to set the color of the stroke, and the numeric field to the right lets you set the overall width of a stroke. Update the existing default stroke width of 1 with 0 (so that the stroke doesn't display). Click the down arrow or select the default 1 in the Stroke Width field and type 0 to set a stroke with a zero width. At the right in the Control panel, locate the Effects text link. Click the word “Effects” to expand the Effects menu, and then select the Shadow button at the top of the menu to access the Shadow settings. 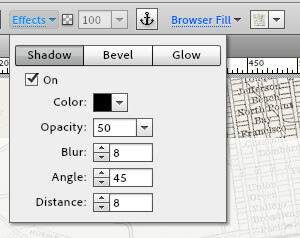 While the Shadow section is displayed, set the shadow color to black by clicking the color picker next to Color and using the Eyedropper tool to choose a black color chip.